The First Fleet of ships to carry convicts from England to Botany Bay sailed from Portsmouth, England, on 13 May 1787. It arrived at Botany Bay on 18 January 1788. When that place proved unsuitable for a settlement the fleet made its way a short distance up the coast and on 25 January 1788 entered what is now known as Sydney Harbour and anchored in Sydney Cove. This page contains statistics relating to the people who made the voyage and provides details of the ships of the fleet. It also provides references for further inquiry, including details of several ebooks, which are held by Project Gutenberg Australia or Project Gutenberg, which provide first hand accounts of the voyage and describe the first efforts to establish the colony. Right: The Bicentennial Monument, which commemorates the arrival of the First Fleet and lists the names of those who arrived at Botany Bay in 1788. 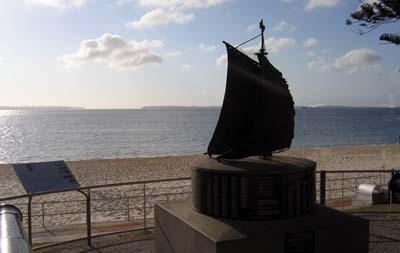 The monument is at Brighton Le Sands, Sydney, and overlooks Botany Bay. Arthur PHILLIP (1738-1814), The Voyage of Governor Phillip to Botany Bay with an Account of the Establishment of the Colonies of Port Jackson and Norfolk Island, London, 1789. This book includes the Journals of Lieutenantss Shortland, Watts, Ball and Captain Marshall, with an account of their new discoveries. The book also includes a List of Convicts sent to New South Wales on the First Fleet, in 1787. George Burnett BARTON (1836-1901), History of New South Wales from the Records,Vol. I This is a significant resource regarding the First Fleet. Gwendoline H SWINBURNE, A Source Book of Australian History (Part II). This ebook contains the text of original documents relating to Phillip's term as Governor of New South Wales. David COLLINS (1754-1810), An Account of the English Colony in New South Wales, Vol 1 London, 1798. David COLLINS (1754-1810), An Account of the English Colony in New South Wales, Vol 2 London, 1802. Daniel SOUTHWELL (1764-1797), Journal and Letters of Daniel Southwell. Southwell embarked as a midshipman in the Sirius in 1787 and was made a mate on the voyage to NSW. John WHITE (1757-1832), Journal of a Voyage to New South Wales. White was the principal surgeon on the First Fleet. George WORGAN (1757-1838), Journal of a First Fleet Surgeon. Worgan was the surgeon of the Sirius. Watkin TENCH (1759-1833), A Narrative of the Expedition to Botany Bay, London, 1789. Watkin TENCH (1759-1833), A Complete Account of the Settlement at Port Jackson, London, 1793. Also refer to the Australian History page for ebooks which cover the early settlement of Australia by Europeans in a general way. Charles BATESON, The Convict Ships, 1787-1868, Sydney, 1974. Mollie GILLEN, The Founders of Australia: a biographical dictionary of the First Fleet, Sydney, Library of Australian History, 1989. This is the definitve reference regarding those who sailed on the First Fleet and contains a biographical entry for every person. It is held by several local libraries in Sydney and by the State Library of New South Wales. Pages at the University of Wollongong web site--personal information about the convicts on the First Fleet . The First Fleet Fellowship web site, an historical society formed in 1984 to provide an association for all those people who have ancestors who arrived in Australia in 1788 aboard one of the ships of the First Fleet. Based in Melbourne. The Fellowship of First Fleeters. A society formed in 1968 composed of descendants of those who arrived in Sydney Cove in 1788 aboard one of the ships of the First Fleet. Based in Sydney. The First Fleet article at Wikipedia. Convict Transportation Registers Database (Online) at the University of Queensland. 6 Transports carrying the convicts. Each transport had a detachment of marines on board. Lieutenant John Shortland, agent for the transports. The garrison was formed from the marines. Store Ships, with provisions, implements for husbandry, clothing, etc. for the convicts. Gillen notes that "during the voyage there were 22 births (13 males, 9 females), while 69 people either died, were discharged, or deserted (61 males and 8 females). As no complete crew musters have survived for the six transports and three storeships, there may have been as many as 110 more seamen who have not been identified, thus giving approximatelt 1530 people who left England and 1483 who reached Sydney Cove. Note that there is no definitive list of the people who arrived at Botany Bay in the First Fleet. We will probably never know the exact number and their names.